You all know how much I LOVE Mabel's Labels for my kids' stuff. It's almost time for back to school and both parents and children are counting down the days! 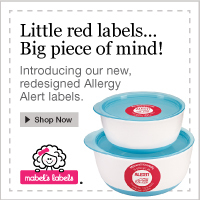 Help the little scholars in your life stay organized this school year with Mabel's Labels. Identify clothes, footwear, books, backpacks and more. Best of all, spend $100 and receive a free package of Write Away labels now through 8/31. There are only a few more days to take advantage of this amazing offer, so don't miss out!